Hold onto your butts, people, because Potty Racers is gonna be a bumpy ride. A longest jump-type game, similar to Fly, Kiwi, Fly!, Potty Racers launches stick figures and portable toilets to impressive new heights through a combination of touch and tilt controls, as well as a full and highly improbable upgrade system. This stinky adventure comes to you courtesy of Addicting Games, the popular Flash game website, and the original Flash version of Potty Racers is still available to play for free online. 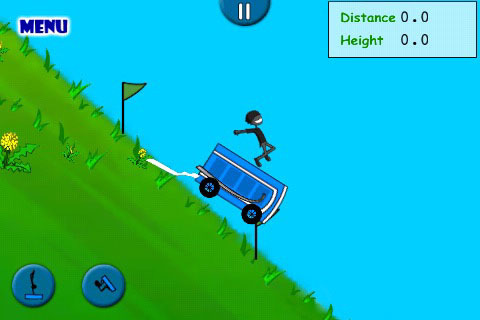 The app version definitely has a slight edge over its Flash roots, but don’t go in expecting too much from a game about launching port-a-potties off of big hills. You start off on a warm-up hill with a stripped down, very basic racer, and once there, you choose your difficulty level. Landing successful jumps wins you cash which you can use to pimp your ride with better wheels, bigger engines, etc. All of these modifications usually result in bigger and better jumps, and once you hit a certain jump height and length distance, you start opening up bigger hills as well. Since the original game used a keyboard control scheme, some big changes were made for the app. This time around, you swipe to get things rolling, and once in the air, you must make use of the tilt controls to bring your poop-mobile in for a level landing. Coming in at an angle or upside will result in your poor little stick man being smeared across the pavement with some rather foul substances. While you’re in the air, you can also attempt to do tricks, which you’ll have to unlock in the store first. These require you to tap the onscreen buttons while you’re tilting your phone around, so be careful, and you don’t want to be in the middle of a trick when the potty hits the ground. The tilt controls aren’t stellar, but even on the hard setting, the game isn’t all that difficult, and it doesn’t take long before you’ve manage to purchase all the upgrades and are jumping off the biggest and baddest hills. Easy mode is a bit on the pathetic side and took me all of 20 minutes to blitz through. Now, Potty Racers is certainly entertaining for the first couple of minutes, but there’s not a lot content and the goals are limited at best. Theoretically, you could play this forever, always striving for a bigger and better jump. Realistically, you’re probably going to get bored of it within the hour, but it’d be a mildly fun hour, with lots of poorly illustrated poop trails streaming from your pimped out potty. 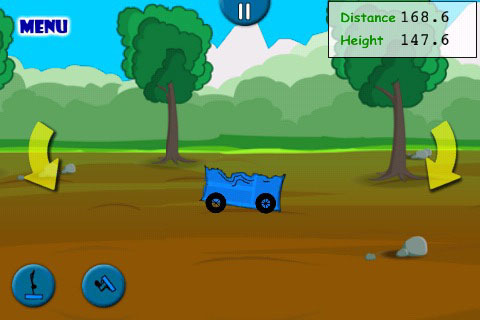 AppSafari review of Potty Racers – AddictingGames was written by Tracy Yonemoto on February 28th, 2011 and categorized under Action, App Store, Games, Physics Based. Page viewed 8777 times, 2 so far today. Need help on using these apps? Please read the Help Page.